A beautiful blend of form and function, featuring well-implemented technology. An excellent, low-tech machine that’s easy to use, but a little harder to master. Anyone, but it’s especially kind to novice baristas, and has enough capacity to handle most small business needs. More experienced baristas. Users who care more about grind quality than quantity. People on a budget. Do you live in a household filled with rabid coffee drinkers? Does coffee play a prominent role in your business or busy office? If you answered yes to either of those questions, and if you want to maximize the flavor of the drinks you produce, then you need a high quality, commercial grade grinder, and if that’s true, then you’re going to love this piece! In the sections that follow, we’ll compare the Baratza Forte vs Mazzer mini. Two astonishingly good grinders with the capacity and capability to handle just about anything you can throw at it. We’ll go through both of these machines feature by feature, comparing and contrasting in order to give you a good feel for which of these might be the better fit for your home or business. Ready to get started? Let’s get right to it! Both models sport a similar look and overall design, dressed in handsome silver with a large, clear hopper mounted at the top and a control panel on their front faces, but of the two, the Forte is significantly smaller, with dimensions of just 5.5” x 5” x 14,” and weighing 13 pounds. Contrast this to the Mazzer Mini, which measures 15” x 10” x20” and weighs a hefty 35 pounds. If space is at a premium, then the Forte is the natural choice. Even if the Mazzer Mini is more to your liking, it’s not so large that finding a permanent home for it will be especially challenging, nor is it so heavy that if you find yourself having to move it from time to time, you’ll struggle to do so. On paper, the Mazzer Mini seems to win this category, hands down. It’s a larger machine and boasts a 20.8-ounce bean hopper at the top, compared with the Forte’s 10-ounce stock hopper. However, it’s not quite that simple. With the Forte, you can buy an optional extension for the hopper, which increases its capacity to 1.2 pounds, which is impressive, given the small footprint of the unit. Yes, that increases the price modestly, and the Forte already costs a third more than the Mazzer Mini, but if capacity matters, then that’s the way to go. If 20.8 ounces is enough for your purposes, then the Mazzer is the logical (and more cost-effective) option. Here’s where things get interesting. Coffee aficionados tend to have strong opinions about what kind of grinding burrs are better, and these two models give you a clear choice. Stainless-steel grinders tend to produce a more consistent grind. The difference is slight, but it’s present, and if quality is your utmost concern, that’s probably the way you want to go. On the other hand, stainless-steel, being metal, tends to heat up with use, so if you’re grinding in volume, then you run the risk of burning some of your fresh grounds, which will render them useable and increase your costs. Ultimately, it comes down to how you plan on using the machine. This is another interesting point of departure between the two designs. 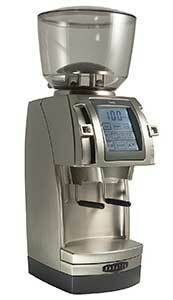 The Forte uses predefined grind settings, which makes it easy for novice baristas to use. It’s just a matter of dialing in your desired grind by number and hitting the button. While some people don’t like predefined grind settings, mostly that comes down to the fact that most grinders don’t offer very many settings to choose from, which limits your options. The Forte handily gets around this options by offering ten different “macro” settings, and another 26 “micro” grind settings, which allows for an incredible amount of fine-tuning. The Mazzer Mini, on the other hand, is a stepless grinder, which gives you unlimited freedom to dial in exactly the grind you want. There’s no need to worry if or whether the manufacturer’s predefined settings align with your preferences or desires because there aren’t any. 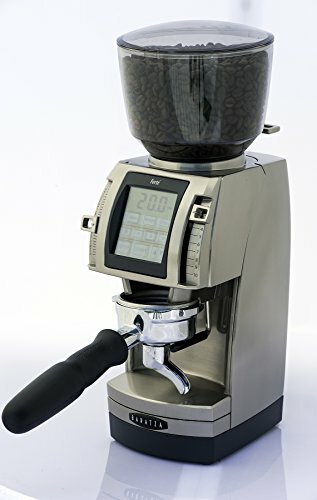 Having said that though, a stepless grinder comes with a learning curve, which makes it a challenge for novice baristas to use effectively, so here, what matters most is understanding your skill level and buying the machine that best compliments you, or the primary users of the machine. This is yet another intriguing difference between the two models. The Mazzer Mini is an analog machine. No fancy electronics present. Everything is dial and knob-controlled. That’s not necessarily a bad thing. No advanced electronics means that there’s less stuff to break, which makes the Mini an incredibly robust and long-lasting machine. 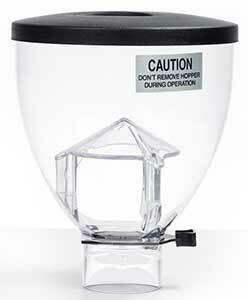 Using the simple controls on the Mazzer Mini, you can adjust the dose to ground between 5.5g and 8g. Contrast that with the Baratza Forte, which has a delightful array of bells and whistles and is fully programmable. You can grind any amount of beans you like. Just set the amount, select your grind setting, and go. Both machines are simple to operate and clean, although there are a few (slight) differences. 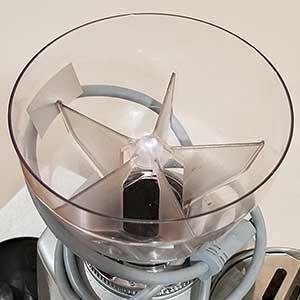 On the whole, the Mazzer Mini, being analog, is easier to use and master. There’s really no learning curve because the controls are simple and intuitive. The Forte, being more high tech, does have a bit of a learning curve, but it is slight, and the machine won’t take you very long to master. A quick read through the user manual should be about all it takes to get the hang of using it. While both machines are easy to clean, the Forte has a slight edge, in that it comes with an automatic cleaning cycle. Just pick up a supply of inexpensive cleansing tabs, pop one in when you need to clean the machine, press the button and let it do its thing. The tablet will dislodge any grounds that get stuck in the teeth of the burrs, and once it’s finished, the user manual recommends grinding 30g of coffee to remove any residual cleansing tab particles so the flavor of your next batch of grounds is not affected. These are two very different grinders, designed with two very different segments of the market. And that concludes our side by side comparison of the Baratza Forte vs Mazzer mini commercial grinders. As we said at the start, both of these are great machines, but given our personal preferences, we’d have to give a slight nod to the Baratza Forte and declare it as the overall winner. We understand, however, that every user is different, and in the final analysis, the Mazzer Mini might be a better overall fit for you, given your skill level and how you plan on using the machine. If your choice comes down to one of these two though, you won’t be disappointed with either. They both come highly recommended. Baratza USA. Official Brand Website. Mazzer USA. Official Brand Website. What Is a Barista? Wonderopolis. 10 Health Benefits of Coffee. Bluepod. The Complete Guide to Coffee Grinders. Roastycoffee.